Just Julie B's Stampin' Space: Super Simple and Bloomin' Marvelous Again! I made this quick card to send out for a birthday. I saw a similar card on Pinterest, I think. It goes back to the basics of stamping, but I love it! Just inkin' up the rubber and stamping randomly - so simple!! 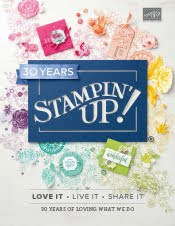 And, once again, I used the Bloomin' Marvelous stamp set - FREE for just one more month as a Sale-A-Bration benefit! And I inked it up with Calypso Coral, Lucky Limeade and Early Espresso.